Call upon the guidance of Fu Hsi, one of the greatest prognosticators of Chinese history and amaze your audience!!! 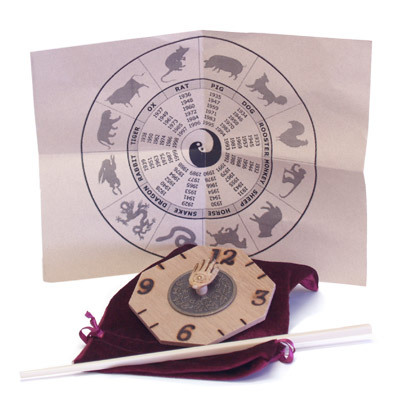 The performer asks a spectator to secretly find his/her birth year on a parchment containing the Chinese Zodiac and to remember the animal associated with that year. From a small velvet pouch the performer removes a strange device comprised of an eight sided disk with the numbers 1-12 burned around it, a Chinese coin containing the Zodiac, and a replica Hand of Fu Hsi in the center! The spectator is asked to secretly find his/her animal on the coin and align it with any number on the disk. Using a chopstick the performer begins to randomly tap the disk when suddenly the spectator yells "STOP! "....and upon doing so the performer has landed on the exact animal secretly chosen earlier by the spectator! Comes complete with Zodiac parchment, chopstick, velvet bag, Hand of Fu Hsi dial, and detailed instructions for performing this amazing trick!